FrostburgFirst, a Maryland Main Street Community, Inc.
As a Maryland Main Street Community, we are responsible for providing economic development opportunities within the context of historic preservation to traditional downtowns. FrostburgFirst uses the Maryland Main Street Five-Point Approach that incorporates design, local organization, promotion, economic development, and sustainability. 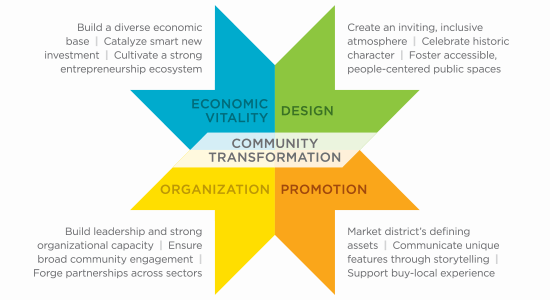 The Five-Point Approach.advocates a return to community self-reliance, local empowerment and the rebuilding of central business districts based on their traditional assets of unique architecture, personal service, local ownership and a sense of community. *Graphic courtesy of the National Main Street Center. Please note that Maryland Main Street adds a fifth point, Clean, Safe, and Green with a focus on sustainability. Downtown Frostburg is a thriving arts, cultural, and business community in the midst of Appalachian beauty. FrostburgFirst’s mission is accomplished with the support of our business and artist members, the City of Frostburg’s contributions through Hotel/Motel Tax Funding, fundraising efforts, and volunteer and community support. Visit our “Get Involved” page to see how to you can make a difference in Frostburg!